Two very different artists, Taylor Zepeda and Pip Barrett’s work is shown side by side, distinctly but commonly seeking to understand or reconcile a their personal position within contemporary culture. Californian Zepeda mashes up throwaway tat, the non-biodegradable with nature and the mystical, to create objects which present a false or futile attempt at transcendence. Instantly attention grabbbing; Barrett’s painted works are humourous and naive, masking a more complex dialogue with self-anxiety, a collection of attempts in navigating a way through the anxieties and pressures placed upon a young woman, faced with the notion of her timeline and future fulfilment. Taylor Zepeda and Pip Barrett are both currently studying on the MFA (Master of Fine Arts) programme at Cardiff School of Art and Design. Whilst both make work which seems reactionary to the times we are in; Zepeda’s work combines a New Age sensibility with elements of throwaway culture to transcend which is both witty yet unsatisfactory, Barrett attempts to navigate her way through it. 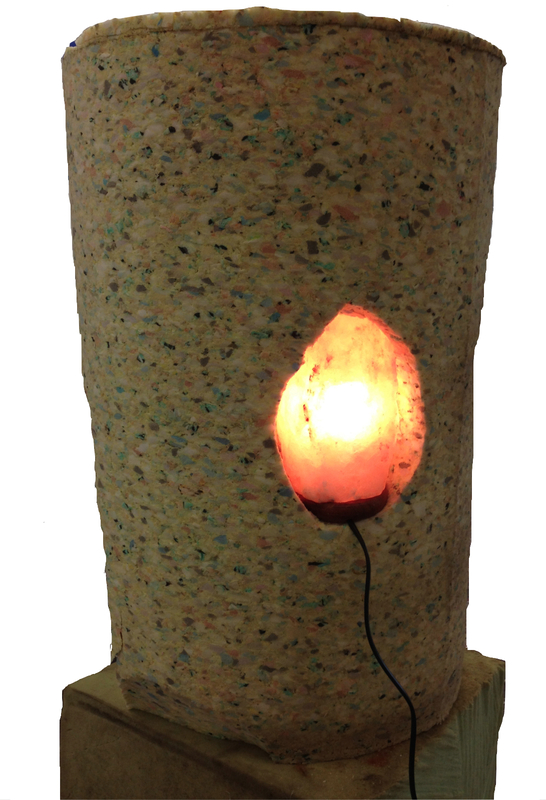 Zepeda uses artificial materials and tacky objects that have little aesthetic value in themselves but have aspirations via a ‘showy’ presence; for example LED lights and salt stones; partially transformed into sculptures which form cheap shots at the magical. Utilising these parts found at boot sales, charity shops, he embeds them within ‘natural’ forms tree trunks made of cardboard and foam; part re-cycled assembly, part crass attempt at the sublime; creating sculptural objects with mock transformative powers. ‘Volcan’ and ‘Chumash’ are such recent works. A current interest in the philosopher’s stone (“a legendary alchemical substance said to be capable of turning base metals such as lead into gold or silver…also sometimes believed to be an elixir of life, useful for rejuvenation and possibly for achieving immortality; for many centuries, it was the most sought-after goal in alchemy. ” ) and the mystical properties of totemic objects and symbols from the Native American Culture of his homeland, stand in paradox to his attempts to weld and recreate potency using two part foam and twigs. The futility and yet strange beauty of his work, humorous, pathetic stand as ironic comments of the hopes / false hopes of our times; straddled somewhere between ecological deliverance and its very destruction. This positioning of contemporary culture within a long-term perspective lifts them into more serious territory beyond the comedy. Indeed the wedding of the lofty and the base is the very stuff of Alchemy. Although entirely different in medium and approach; Pip Barrett’s paintings and drawings also comment on contemporary life. Barrett’s works are more like gestural drawings using paint rather than paintings, the medium a conduit to her thought processes as she develops a personal symbolism through the work to both simultaneously display, confront, amuse and negotiate her way around the pressures and expectations she feels the media places upon her as a young woman. Her fast, scratchy yet attractive paintings map thought processes, raw and engaged, using a crude language to negotiate her rage at an apparent reduction of being; into a one dimensional biological vessel as defined by being in her fertile prime as young woman. “You’re a woman. Bought” is the title for the series of work created through examining the uncertain emotional relationship to a sense of a biologically determined future, yet this is just one source of her anxieties. ‘The Plan’ is a painting which shows a series of lines and circles, instantly visually attractive like a beautiful map or constellation, actually a representation of a bird’s eye view of people’s heads. Barrett’s work results from her attempts to make sense of the relationships that personally govern her world and from this we sense the power, frustrations and humour of someone who is sometimes able to stick her head above the clouds and look down on the clamour below, developing a route and a language to help her through the sticky mess. In placing these artists works together, we see a common humanness in their attempts to answer anxieties routed deep within themselves, in perceived relation to the attitudes and behaviours of their culture.